The .338 Lapua Magnum is an exceptional long-range cartridge, complete with a painful muzzle blast and heavy recoil. 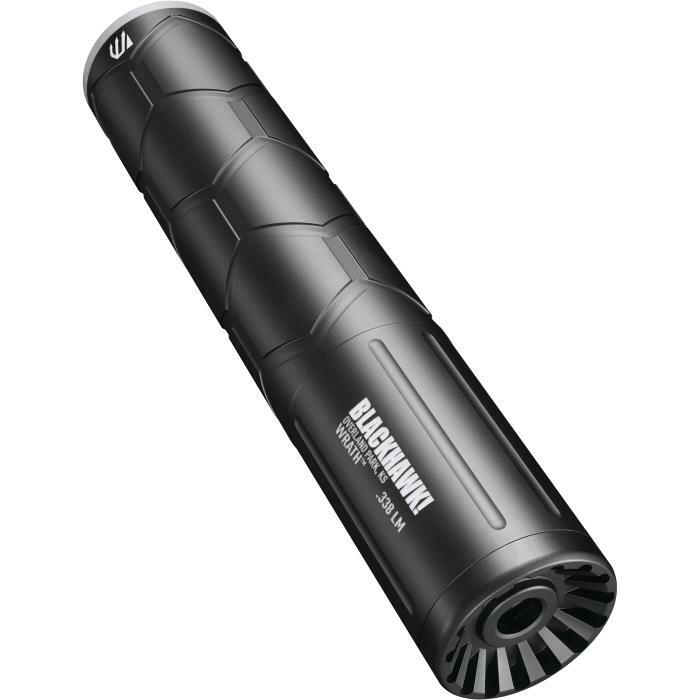 The Wrath™ .338 LM Suppressor tames the big-bore monster, reducing recoil to feel like a .308. Even the mighty .338 LM can be muffled: the Wrath™ cuts muzzle blast to 136 dB. Most don’t believe it until they hear it. The hardened, stainless steel baffle stgack ensures a lifetime of high-pressure use. The Wrath™ is encased by hex-skived, aircraft-grade aluminum for a signature look. At only 17.1 oz., the Wrath™ is also a deadly-accurate pairing with your long -range hunting rifles, producing a quiet, low tone. The Wrath™ has minimal and repeatable POI shift, turning on to your muzzle with the available BLACKHAWK!® direct-thread or QD mounts. (Sold separately).